Now we can cope with a giant albino monkey. We’re OK even with a giant mutant alligator. And no probs whatsoever with a 30 foot wolf – who flies. 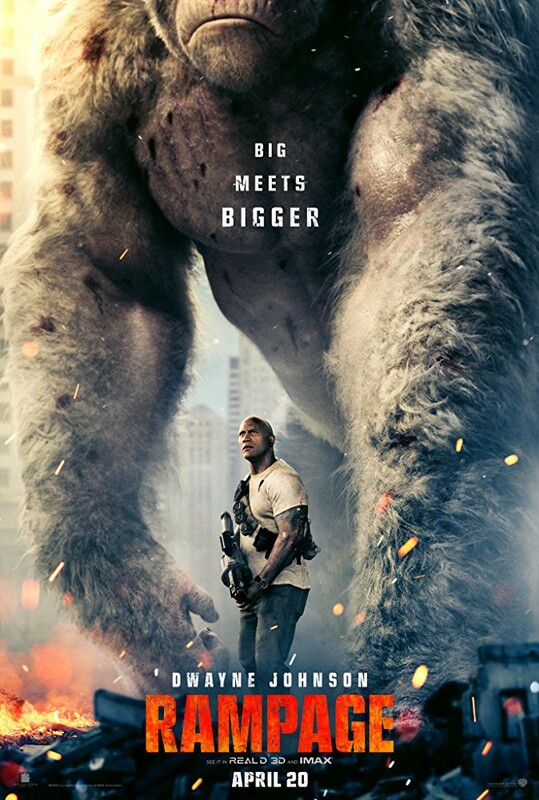 But come on – Dwayne the Rock as a primatologist? You’re pushing it man, you’re really pushing it. Thankfully, he’s also an ex-black ops primatologist (yeah, who knew) which slightly helps to un-strain credulity. Here he is friends with George, formerly of the jungle, his albino ape-mate who, along with the other beasties mentioned, falls foul of an amazing gene splicing pathogen that – literally – falls from space, courtesy of a pleasing, and unexpected, opening sequence that also features a killer mutant rat. 1: It has no sense of jeopardy. One of the reasons a movie like Ghostbusters worked so well (and the comparison is viable - big summer movie - check! Big ape and/or Marshmallow Man - check!) is there came a point – and it’s around the time Bill Murray says “Nobody steps on a church in my town!” – where you know these ordinary people, no matter how many quips they utter, face up to the fact that they are willing to die to save the people around them. It is, in short, heroic and it elevates that movie from merely a comedy with lots of fx. Dwayne the Rock’s key problem is that he has never in any way resembled an ordinary person – a tree trunk is closer. At one point he gets shot in the stomach point blank – and merely spends the next half-hour occasionally holding onto his side. So clearly, a “difficult” ending is never in doubt at any point for we the audience. 2: The film’s “villains” - a bumbling corporate pair of siblings (big business is the bad guy!) – are badly written and even more badly played by Malin Akerman and Jake Lacy, to the point where they seek to redefine the word “ineffectual”, leaving the film with no sense of jeopardy and no real villains – the three mutated creatures being more victim than bad guy after all. 3: No fun. Whilst director Peyton takes a great deal of time to play with his collapsing buildings software – often in slo-mo, like we haven’t seen it a million times before! – he, and all those around him, simply forget to have fun. This can be big, this can be dumb even, but Christ it’s supposed to be fun!! So, there’s bang for your buck here to be seen. There’s enough “formula” to feel like even though you’ve seen it all before, the familiarity will make you comfortable with it. As early summer movies go, it’s a solid opening blast – issued in the hope of better, if not bigger (though probably bigger) to come. In other words, a perfectly serviceable bit of low expectation/low denominator blockbuster. But certainly nothing more than that.